Tony Abbott promised a government that would be transparent and accountable. Malcolm Turnbull promised to respect the intelligence of the electorate. But increasingly, we are seeing a government who is a law unto themselves, a government who seems to view Treasury as their private piggy bank to use as they see fit, a government that showers largesse on their supporters at our expense, a government who thinks we have no right to know what they are doing as they strip away our privacy rights in the name of national security. This gift was made without any tender process or any consultation with the Great Barrier Reef Marine Park Authority who have 206 full-time equivalent employees. Very similar to the $30 million gift given to Fox Sports to cover “niche” women’s sports on pay tv. Whilst the government has refused freedom of information requests about correspondence relating to the gift, as it coincided with licence fee cuts for free-to-air channels, it seems obvious this was about keeping in good with Rupert. Another hot topic where the government is stonewalling is why, on two separate occasions, Peter Dutton personally interceded to grant working visas to two young women who arrived on tourist visas but had the intention of working as au pairs. All it took was a phone call from someone to Dutton’s office and hey presto, he overrules the immigration authorities and laws. Mike Pezzullo, refused to answer any questions at senate estimates, taking them on notice even though others sitting with him at the table may have been able to provide the requested information. Michaelia Cash has adopted a different approach in refusing to answer questions about her involvement in tipping off the media about a raid on union headquarters about a donation that was made over a decade ago and appropriately declared at the time. As it is under police investigation, she can’t comment. Surprisingly she has had no such hesitation in commenting on investigations into union activity, declaring people thugs and criminals only to, on countless occasions, have the prosecution case abandoned before it begins. One such case was the recent dropping of blackmail charges against John Setka and Shaun Reardon. When it turned out that Tony Abbott and Eric Abetz had met with executives from Boral who then changed their story, the prosecution beat a very hasty retreat, a move the magistrate said was “a very sensible decision”. One thing the government prides itself on is stopping the boats. But we never did get to the bottom of the story about whether, as overwhelming evidence suggests, they have been paying people smugglers to take the boats elsewhere, making it someone else’s problem. The fact that that is illegal seems to have slipped by. 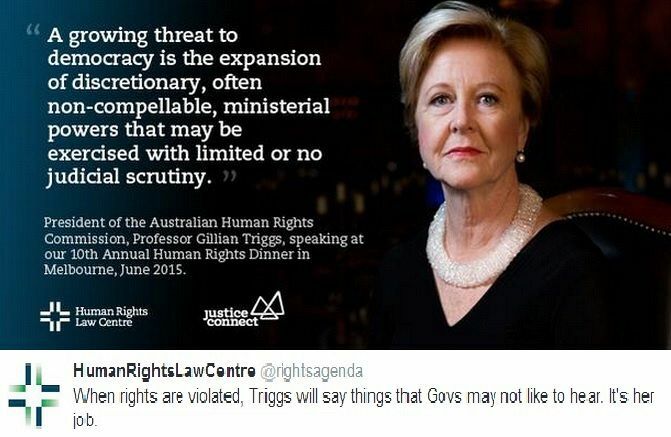 Another power that the government has used with relish is its chance to appoint people to boards, tribunals, and statutory bodies, the most egregious example being the sacking of disability commissioner Graeme Innes from the AHRC to gift Tim Wilson a high-paying job with an organisation that he had called for to be dismantled. The job was not advertised and Tim did not have to submit an application or go through an interview process. George Brandis just rang him up and said have I got a deal for you! As Tim had no qualifications or experience in anything really, other than scribbling for the IPA and constant appearances on the ABC, they had to make a new position for him. It didn’t really matter what because it was just so he would get lots of government money (I thought he was a libertarian?) and have something to put on his resume as he filled in a couple of years waiting for preselection in a safe Liberal seat. I sometimes wonder if Tim feels any guilt about the price people with disabilities paid for his leg up onto the stage he so coveted. Somehow I doubt it ever entered his mind because, as we can see from these few examples among countless others, honesty, integrity, accountability and acting in the best interests of the country are not considered important by a government who does as it pleases and feels no obligation to answer to anyone. Thank you Kaye, how right you are. How good is this article? Bloody brilliant, as usual Kaye!The really disgusting “thing” about ALL the Liberal actions is that they are all (what they would say), if this was done by Labor, as “illegal, immoral” etc. Of course, we all know how anything that was done that was considered “bad” is always attributed to Labor, & by the same token anything considered “good” must have been done by the Liberal lot! Let us not forget just how much they ALL lie (about anything! ), all these flat earth, right wing, inept excuses for a political party–the all powerful, wonderful & truthful Liberal party, NOT!! ALL these obscenely wealthy & obscenely over-paid & under-worked effing Liberals are nothing but a blot on our Political landscape & a disgrace to humanity! All “normal thinking” people MUST ensure this bloody rabble do not get re-elected again! Another good article Kaye. So much wrong with this government. Good to see some of them aired in your article. Might be a good reason for a Federal ICAC, or even a Royal Commission should Labor achieve power. Especially if Abbott and Abetz are involved. Great article Kaye Lee – Just in the midst of question time in the HOR now – muting all of the Dorothy Dixer questions and answers and the inescapable fact is that the LNP act with complete impunity. Turnbull’s smugness and dishonesty is palpable. I vote Tim Wilson’s appointment to the AHRC as being the most corrupt action in quite some time. He is nothing but a smarmy little sycophant and with his IPA pedigree he is the very antithesis of the persona and character required for such an organisation. $30M was given to Murdoch last year and another $30M was given this year to be paid over 4 years. One reason Fifield gave was that the monies were given to boost Foxtels subscriber base. Let’s not forget the $880 million tax refund we gave to Rupert in 2014. He lent himself money in one currency and then paid it back to himself in another currency and claimed deductions for foreign exchange losses. The ATO’s 28-day window to mount an appeal coincided with the federal election campaign, during which Mr Murdoch’s newspapers ran heavily against the Labor Party. They gave up the fight a week or two before the election (I think). One wonders who made that decision. This makes a mockery of Christian Porter saying in a letter to Mark Dreyfus that he has determined there is no ‘persuasive evidence’ that there are gaps in the current system for tackling corruption at the federal level. This has a familiar ring to many statements made by LNP that a Royal Commission was not needed into the banking system duster. Level of trust in LNP ZERO!!!!!! That was worth tweeting – recipients included Abbott and Wilson from the Do-as-I-say-Not-as-I-do Party. Let us not forget that IPA stalwarts James Patterson and Georgina Downer also donned that blue Liberal Party parachute that Tim Wilson used to further their right-wing political careers. Bloody Disgusting! Will somone go to IPA headquarters, take that thing out of the cupboard and slash a huge hole in the canopy before carefully folding it and putting it back in the cupboard? We can only hope that Lady Fishnets Downer does not prevail in the byelection. I know what you mean totaram. The whole bloody thing is so draining. I have, on occasion, written about suggestions of better ways forward and may try again. But it seems so pointless while the Coalition are in power. The solutions, or at least improvements, are all out there but we are held back by inadequate people so engrossed in power struggles that they have forgotten how to be constructive. I seem on an endless fact check but it’s hard to let the lies pass unmentioned. Perhaps we can get enthusiastic about suggestions when we have a government who may(?) care to listen? Perhaps we can encourage good people to run for preselection? In the mean time, we have to keep up the pressure. Ring politicians’offices. Email them. With election in the wind they are more likely to at least keep a tally of what the whinges were about. Make them nervous. Or support the ones who are doing well. Or the bad ones when they make a good decision. It happens occasionally. I rang Tim Storer to say thanks – he seems very sensible so far. I even messaged George Brandis after he berated Pauline Hanson.